Berry Pink Lemonade Prosecco Punch is flavored with puckering raspberry lemonade and bubbly Prosecco and topped off with the sweet bursts of fresh berries! 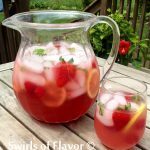 Perfect for Mother's Day or any summertime get together! Combine Prosecco, lemonade, grenadine and vanilla. Pour over ice. Stir in raspberries, strawberries, lemon slices and basil. Serve immediately.